Passionate animal rescuer Tehree Gordon is challenging other older residents to continue to make a contribution in their later years after being recognised in the 2019 Australia Day Awards. As a past recipient of the Senior Australian of the Year Award in 2004, Mrs Gordon and her “amazing supporter”, husband Hamish, were invited to this year’s Australia Day celebrations in Canberra. The Barwon Heads resident said the highlight of Australia Day for her was “witnessing so many wonderful Australians receiving honours and hearing their stories”. “I’m humbled but ecstatic to receive an OAM,” she said. Ms Gordon described herself as a “passionate Australian but still very humble”. “I’ve had people asking me, ‘So now you’ve scored another award, when are you going to retire?’. I just say, ‘I’m 75 now and there’s no use-by date,” she laughed. “There is still a role in the community for people of our age. If it can help make a difference it’s worth doing. “I still want to educate people about wildlife and the environment. 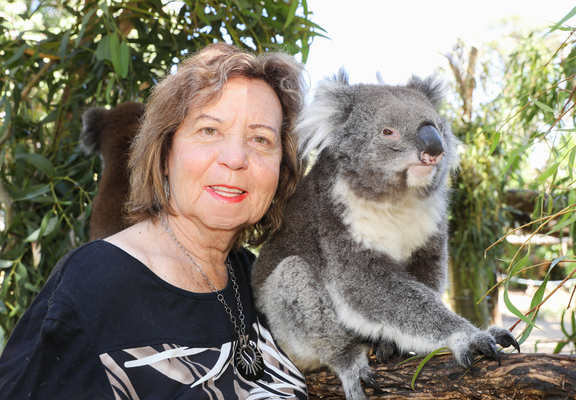 Mrs Gordon’s OAM formally recognised her service to conservation and the environment. She has also been a foster carer for 41 children over 30 years and regularly hosts people with disabilities or special needs. “The one thing I’ve pushed all my life is respect for the environment and community. It’s also important to acknowledge that it’s okay for people to be different,” she said. Two other Bellarine Peninsula locals were also among Australia Day Award recipients. Portarlington’s Werner Bischof received an Australia Medal (AM) for “significant service to dentistry, and to professional dental organisations”. Wallington’s Terry Wills Cooke received an (OAMN) for his service as chair of the CEO Institute since 1993, as president of Geelong Art Gallery, and as a co-patron of Melbourne Symphony.